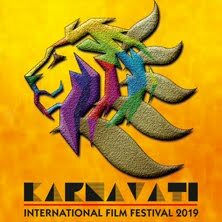 The list of prominent associations supporting the upcoming Screen Print India 2012 / ASGA India 2012 Exhibition has increased still further as Mumbai Mudrak Sangh has also confirmed its support for the Screen Printing India 2012 / ASGA India 2012 Exhibition. Committed to the future of the print industry, MMS was formed fifty years ago with the primary objective to co-ordinate, motivate, innovate, improve, expand and elevate the state of the industry. With the MMS also pledging its solidarity, MMS hopes to achieve this through meaningful mobilisation of the printer's abilities towards achieving excellence and creating mutual trust. MMS has been fortunate to have many stalwarts from printing industry as its Presidents. They built the reputation of MMS as a principal organisation in the city of Mumbai who looked after the interests of printers.In order to have a close relationship with printers providers, MMS has broad-based its membership. Not just that, with a view to help printers in Navi Mumbai, MMS extended its jurisdiction. Today, MMS is affiliated to the Maharashtra Mudran Parishad (MMP) and is an important constituent of it. MMS is a key participant in the working of the All India Federation of Master Printers (AIFMP) and attends Governing Council meetings and conferences. MMS' representatives have been elected office bearers of AIFMP. Screen Print India 2012 / ASGA India 2012 will be the 10th International Exhibition on Screen, Textile & Digital Printing Materials and Equipments. Spread over 3,000 sq. mtrs. it will bring these three segments together on one common platform to complement each other. Latest materials and equipments employing advanced technologies from around the world will be at display at the Screen Print India ™2012 / ASGA India 2012 Show. 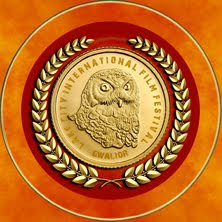 The 2012 edition will be held on September 5, 6, 7 at Hall 1A, Bombay Exhibition Centre at Goregaon (E), Mumbai. The Exhibition has been organized every two years since its debut in 1994 and is considered to be one of the Asia's most respected exhibitions, attracting exhibitors and visitors from across the globe. The International factor in the exhibition has become even stronger with the ASGA Board Meeting to be held in Mumbai, just a day prior to Screen Print India 2012 / ASGA India 2012. The show would be visited by ASGA delegation from 11 countries as well as exhibitors and visitors from across the globe along with the heads of major brands. Esko proudly announces the first installation in South Asia of a CDI Advance Cantilever 1450 with HD Flexo technology at Numex Blocks. Armed with the most advanced digital flexo imaging solution on the market, Numex Blocks will be able to provide flexo printers across India the high quality level that was originally only achievable in offset or gravure. With the capability of the CDI Cantilever to image both plates and sleeves, the company is gearing up for the requirements of tomorrow's flexo market. Founded in 1985, Numex Blocks (Mumbai, India) is a well-established Indian prepress trade shop specialized in flexo and letterpress plate production for the flexible packaging, labels and corrugated markets across India. The company always had a strong strategy of investing in the most advanced technology - in 2002, it was the first trade shop to offer digital flexo plate making in India. 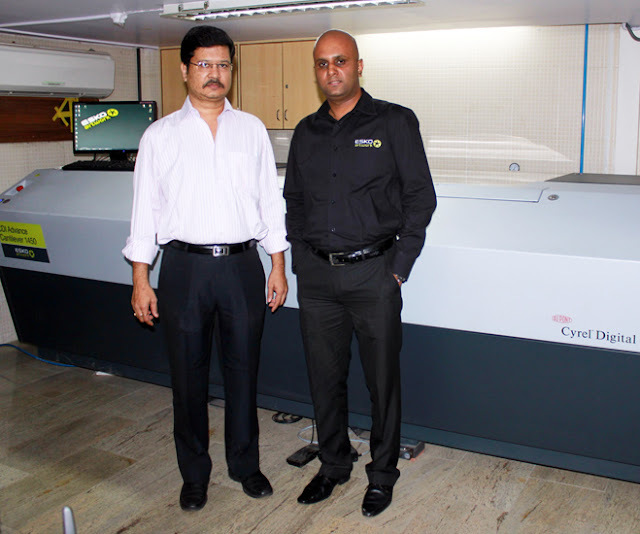 After ten years of successfully producing digital flexo plates, the company again takes the lead in the Indian flexo market with the investment in Esko's CDI Advance Cantilever 1450 with HD Flexo - guaranteeing its clients the highest quality print results they demand. Over the years, Numex Blocks also continuously upgraded its workflow software and works today with Esko's Suite 10 preproduction software. The company is looking forward to the new Suite 12 that Esko will be launching at drupa 2012 in May. While the CDI Cantilever enables Numex Blocks to meet the today’s demand for higher quality plate imaging, it's the capability of the unit to also image sleeves which offers the company the greatest opportunity for new business growth in the future. The Esko CDI Advance Cantilever series are specifically designed to deliver the highest quality imaging on both plates and sleeves. The 1450 model images digital flexo sleeves up to a sleeve length of 57" / 1450 mm. It comes equipped with a plate loading table, and a vacuum drum-sleeve with Easy Clamp to securely hold down flexo plates of a size up to 42" x 60" / 1067 x 1524 mm, at a speed of up to 8.0 m² per hour. With Esko's HD Flexo technology, the CDI Advance Cantilever offers the highest quality level, comparable to offset and gravure. Combining HighRes optics of 4,000 ppi with unique finely tuned screens specifically designed for higher imaging resolutions on flexo plates, HD flexo delivers extended color gamut and improved solid densities, smooth vignettes and reduction of correction and retouching of CT images. Esko is the worldwide market leader with software for artwork creation, structural design, preproduction, workflow automation, quality assurance and online collaboration. Esko solutions support and manage the packaging and print processes at brand owners, retailers, designers and packaging manufacturers. Avery Dennison, a global leader in pressure-sensitive label and packaging materials, has completed a major expansion of its production facility in Pune that will significantly enhance the company’s production capacity to meet the growing demands of the Indian market. The ISO-certified Pune facility produces technically advanced pressure-sensitive materials for labeling and packaging and is one of Avery Dennison’s most advanced operations. The expansion, housed in a 100,000 square-foot site adjacent to its current facility, includes a new state-of-the-art, high-speed materials coating machine, the widest and fastest in India, which together with finishing equipment and coater comprise a full production line. The move further underlines Avery Dennison’s commitment to India, bringing the company’s total investment to date in the country to approximately $55 million USD. The plant has undergone three phases of capacity expansion since the plant opened in 1998. This fourth expansion puts the facility at 130,000 square feet – four times its original size. The investment is in response to the rapidly growing Indian market demands for label materials as retailers increasingly recognize the importance of packaging and branding to differentiate products and drive consumer choices. “We are here for a long haul and India is a big growing market providing us opportunities to grow at a high double digit year-on-year,” Dean A Scarborough, chairman, president and chief executive officer, Avery Dennison, said. He said with the major expansion of its production facility at Ranjangaon, near Pune, and launching of a new innovation centre in Pune and a knowledge centre in Bangalore, the company has invested a total of $200 million till date. He said India was an important growing market globally and therefore, the company has also launched its second knowledge centre in Bangalore after China. “This centre will deliver innovative packaging and labelling systems and branding solutions to our growing customers,” Scarborough said. He said the fourth innovation centre opened in Pune with 20 top engineers at present, will focus to provide research and innovation development services to the Indian market. “The team will be increased to 200 in the next two-three years to generate global solutions for the company,” Scarborough said. The other three centres are located in USA, China and the Netherlands, he said. The fastest growing label and packaging materials (LPM) division manufactures and markets products under its Fasson brand, including pressure-sensitive and non-adhesive coated papers, films and foils. 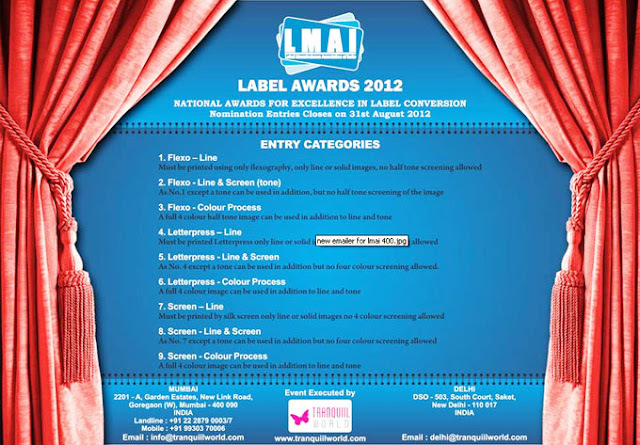 LPM products are widely used in brand identity, bar-code labelling systems, product identification and other applications by label converters and consumer product companies. Avery Dennison India has three manufacturing facilities in Gurgaon, Pune and Bangalore. “Our existing three major businesses in India in labelling and packaging, retail branding and information solution and speciality materials together generated $155 million in sales revenues last calendar year and we are targeting at over $300 million in the next two-three years,” Scarborough said. Avery Dennison’s Label and Packaging Materials business is the leading manufacturer of pressure-sensitive label materials in India, and has seen year-on-year double-digit growth since its inception in 1997. 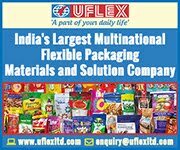 The business is able to better serve customers thanks to its national footprint, which includes the expanded Pune plant, two plants in Gurgaon and a recently commissioned distribution center in Bangalore. During the opening ceremony, Avery Dennison also announced two more significant developments in India: the establishment of a new Innovation Center in Pune and a Knowledge Center in Bangalore. The Innovation Center will be the third of its kind for Avery Dennison, which has existing centers in the US and China. It will provide dedicated research and innovation development services for Indian converters and original equipment manufacturers, while simultaneously providing growth opportunities for India’s pressure-sensitive labeling industry. The Pune Innovation Center will be operational by mid-2012 and is expected to grow significantly in terms of dedicated resources over the next two years. To help nurture and grow the industry in India and South Asia, Avery Dennison is creating a label and packaging Knowledge Center in partnership with original equipment manufacturers. Expected to commence operation in Q2 of 2012, the Knowledge Center is intended to provide training and knowledge transfer on all major aspects of labeling technology from label production materials to pre-press, printing and converting. It will also address the business dimension such as coating and inventory management to deliver an effective and highly comprehensive means of knowledge sharing that will help foster the growth of the industry across South Asia. At Dscoop 7 in Washington, DC, Label Traxx - the print business management software for flexographic and digital narrow web label printers and converters - showed the latest version of their powerful software. The company also introduced Digi Traxx, a powerful new tool that gives companies with existing business management systems the ability to automate order production to the HP Indigo press. Digi Traxx accepts orders directly from an existing MIS system via XML, adding key data elements such as digital eye marks and step and repeat, not in the existing system. Digi Traxx then creates the necessary JDF files and sends them to the HP digital front end or to Esko Automation Engine 10. Label Traxx provides automated job management software for the printing industry. The company was formed as Tailored Solutions in 1993 by Ken Meinhardt and David Porter, both of whom remain active in the business. Worldwide, Label Traxx is the most popular print business management software for flexographic and digital narrow web converters and printers. Label Traxx is designed for use on both Macintosh and Windows platforms. Atlantic Zeiser Group, a leading developer and supplier of modules and end to end system solutions for industrial digital and security printing, has developed and installed an integrated printing module at August Faller KG. The OMEGA 72i DoD inkjet printer and eco-friendly UV LED curing system SmartCure 75/400 for folding carton production has been designed to meet the special demands of pharmaceutical folding carton printing, coding and quality verification with wastegate control for medicinal product packaging. Using this equipment Faller, in Waldkirch, Germany, codes, serializes, prints and verifies pharmaceutical packaging for the world market and renowned pharmaceutical producers. With the OMEGA printing, serialization and coding solution from Atlantic Zeiser, variable data is applied in plain writing, as a 1-D barcode as well as a 2-D data matrix code. Directly after printing VERICAM checks the quality of the grading and, if necessary, triggers a wastegate, which automatically segregates products of unsatisfactory quality - thus ensuring a zero-fault rate in production. In this case the demands of pharmaceutical customers are special, in order to fully comply with country-specific marking standards for the purpose of product identification and product traceability. One particular project concerns printing and coding of medicinal product packaging for the Chinese market. For this, apart from Chinese writing, a defined barcode must be applied, which contains an authentication code for product tracing, a serial number and a product code, which follow the Chinese NDC (national Chinese medicine code). The OMEGA printer and camera-based quality control is fully integrated into Faller’s folding carton production line. Efficient coding and serialization of small runs and batch sizes with high flexibility of the printing solution are feasible due to the highest degree of variability provided by the DoD inkjet print solution from Atlantic Zeiser. As a result of the possibilities of individual printing with variable data in divergent forms Faller’s pharmaceutical customers can also reduce their stock holding of pre-printed folding cartons as they can be coded and serialized during the packaging process at the various locations of medicinal product manufacture. This production step is already covered in the fabrication of the flat folding cartons at Faller. The high quality requirement of 360 dpi is due to the small dimensions of the surface to be printed on each individual folding carton. 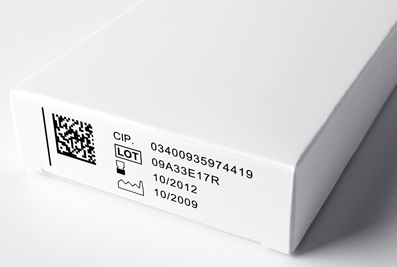 Four different pieces of information: serial numbers, authentication and product codes as well as other variable data must be applied individually and fully machine-readable on this surface within the 1-D barcode. Specific characteristics for pharmaceutical packaging, required by the European Union, can now be applied easily via bar codes, serial or random alphanumeric sequences or via 2-D data matrix codes on the folding carton. Additionally printing of images and the personalization of the folding cartons for special target audiences or applications such as names or addresses are also possible. For marketing this opens up spaces that until now have been unused. August Faller KG with the OMEGA technology meets the demands for readability of codes (grading) and the integration of a wastegate function for sub-standard products, as specified by the relevant regulations. A camera system verifies the codes and checks the correctness and quality of the printed information. At drupa in hall 11 stand C56 Atlantic Zeiser is exhibiting industrial digital printing solutions under the slogan “Beyond Printing“. Flexo Plate Digital, a leading flexographic repro house in Asia announced plans to unveil its newest digital flat top dot plate making system at a technology showcase and open house on April 17, 2012. The event will be held at the company’s factory in Jakarta, Indonesia. “In addition to Flexo Plate Digital, representatives from Kodak, DuPont, Siegwerk and Gallus will be on hand to help facilitate the flexo technology seminar and answer customer’s questions,” Oh added. The information-packed event will allow packaging printers and brand owners to see the latest innovations in flexography, both in software and hardware in plate making. Plates from the Thermoflex Wide CTP system will use DuPont digital plates during the open house. The standard digital flexo plate is for offset spot varnish and highspeed, high quality flexo printing for packaging industry. In the same workflow, printers can also see demos of the Flexcel NX Wide from Kodak which will offer flat top dot that promises higher ink densities, full tonal reproduction, predictable plate making and printing, and consistent stable, robust printing. Flexo Plate Digital offers a wide range of products and services specifically designed for packaging industry. As a leader in digital flexo plate making, Flexo Plate Digital is proud to show Asia’s first Flexcel NX Wide from Kodak, taking advantage of the new 42 x 60 inch (1067 x 1544mm) plate size for larger layouts for greater job efficiency. The new flat top dot technology will equip its customers to compete for business traditionally beyond the capabilities of flexo, enabling print buyers to benefit from both flexibility of cost effectiveness of flexo and the quality they would expect from offset and gravure. Flexo Plate Digital will also discuss the company’s business strategy and in addition Kodak, DuPont, Siegwerk, and Gallus executives will speak on industry trends, productivity and innovation, and the challenges and opportunities facing the industry. Once again Q.I. Press Controls demonstrates its capacity for innovation! During the Drupa 2012 print media fair in Düsseldorf, this world-renowned manufacturer of highly advanced quality control technology reveals its most recent development for web offset presses: the mRC-3D detection camera. The mRC-3D detection camera has now been equipped with double sensors and automatic self-cleaning. This means an extra gain in efficiency for users! Heat-set and cold-set rotary printing are high-speed processes in which quality and customer satisfaction come down to nanoseconds; misregister and/or colour deviations are no longer accepted in the battle for the reader/consumer. In order to achieve this and meet the need for the highest efficiency, Q.I. 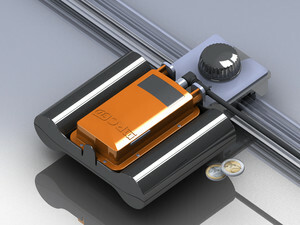 Press Controls’ engineers have developed this new generation of automated detection. The double-sensor technology not only doubles the possibilities but can also cope more effectively with depth; which is the reason for the 3D designation for mRC’s latest detection camera. This concept proves its great added value particularly well in case of unsteady paper web routings and/or surfaces. Since detection cameras in production processes can become obscured, this would usually require printing personnel to carry out cleaning. Now, this is no longer needed! The Automatic Ink Mist Shield (AIMS) clicked into place in front of the camera rolls a new antistatic crystal-clear section of film in front of the sensors and, after fully automated calibration, the precision measurements resume undisturbed. And this without any action on the part of printing personnel, in only a few seconds, at any location on the rotary press. The launch of the mRC-3D at drupa will be accompanied by news about version types, costs and availability. It will also emphasise how this innovative high technology contributes to reducing costs, minimising press running time and reducing downtime. At stand A24 – Hall 17 Q.I. Press Controls is showing its full range of computerised quality control on rotary presses. It's certainly worth a visit! Diversified Graphic Machinery will highlight its exclusive, Foildex in-line cold foil system, Cast and Cure holographic effect system, hot foil stamping, die-cutting technologies and complete line of print enhancement capabilities in Hall 15 / A21-2 at Drupa ‘12, May 3-16 in Düsseldorf, Germany. Serving the US market since 2000, Diversified Graphic Machinery recently announced its expansion into Europe with the establishment of a manufacturing facility in Torino, Italy. “The Torino factory will be used to manufacture our Foildex cold foil systems as well as our Filmdex UV Cast and Cure systems and will allow DGM to better serve global packaging market,” DeBard added. The DGM Foildex system allows companies to use cold foil efficiently and profitably by minimizing foil waste and bringing foil cost for cold foil applications to hot foil levels. Foildex offers proprietary control systems which produce the best foil laydown in the industry with superb overprinting. With large area coverage and miniscule reverse out, the system gives a new dimension to print enhancement. 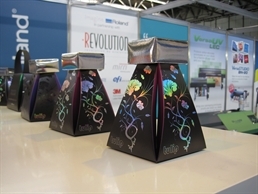 Coupled with the ability to produce holographic images with the DGM Filmdex UV film Cast and Cure inline with cold foil and print, gives packaging printers a powerful sales tool and a unique niche in the marketplace. A MacDermid LUX installation at OEC Graphics marks the 100th installation of the LUX Platemaking Process since its commercial launch. Introduced at the FTA INFO*FLEX in 2010, the LUX Platemaking Process enables the production of flat-top dots on flexo printing plates, creating a smaller printed dot and increased print quality and consistency. OEC Graphics, headquartered in Oshkosh, Wisconsin is a leading prepress supplier to converters and packaged goods companies. OEC has added the LUX Platemaking Process to its production workflow in a number of its facilities. "Adding LUX flat-top dots to our product line-up puts us in a unique position to offer our customers unsurpassed performance and technology that can compete in any packaging market," said Brad Vette, corporate managing director at OEC. MacDermid's LUX has been the global choice for flat-top dot technology since its inception, with LUX installations on six continents. "Given the tremendous interest we have seen with LUX, we are anticipating that we will install at least another 100 units in 2012," stated Pat Mullaney, global packaging group director at MacDermid. In addition to celebrating the 100th Installation of LUX, MacDermid is also marking the introduction of two new enhancements to the LUX Process - Membrane 200 and an new version of its large-format 62" Laminator. Membrane 200 is another option for the LUX Platemaking Process that allows the simultaneous creation of both flat-top LUX dots and an engineered surface pattern in the plate. This innovation combines the print advantages of the LUX dot shape and the improved ink transfer of a surface pattern in one simple step. The updated 62" LUX laminator laminates plates up to 62" in width and includes several new features that make lamination of the LUX membrane easier and more efficient, including digital control of gap settings, a membrane hold-down device and pin cutter, and a transition table to ease plate movement from the laminator to an exposure unit. LUX was the recipient of both the Flexographic Technical Association (FTA) Technical Innovation Award and the Flexographic Pre-Press Platemakers Association (FPPA) Technology Innovator Award in 2011. As a new lighter weight label paper, EcoPoint 40 lb offers label printers the ability to supply more labels per shipment to beverage bottling operations, effectively reducing both shipment frequency and storage of finished goods. NewPage Corporation announced the introduction of 40 lb. (65 gsm) EcoPoint, a new wet strength label paper offering environmental and performance advantages for the bottled water, juice and soft drink industries. EcoPoint 40 lb. offers a notable source reduction advantage to beverage producers, with up to a seven percent reduction in label paper usage when compared to traditional 43 lb. (70 gsm) bottle label papers, and is designed for optimal performance in continuous roll fed labeling operations as well as cut-and-stack labeling machines. As a new lighter weight label paper, EcoPoint 40 lb offers label printers the ability to supply more labels per shipment to beverage bottling operations, effectively reducing both shipment frequency and storage of finished goods. Bottling line productivity also increases as more labels can be stocked in labeling equipment, resulting in longer continuous bottling runs with fewer changeovers. EcoPoint is available with third-party chain-of-custody certifications to the Forest Stewardship Council (FSC) (BV-COC-953662), the Sustainable Forestry Initiative (SFI) and the Programme for the Endorsement of Forest Certification (PEFC) schemes. EcoPoint 40 lb. joins the broader range of label papers from NewPage for beverage markets which includes DuraPoint, ProPoint and LithoPoint product brands. In addition, NewPage manufactures specialty papers used in flexible packaging, technical and pressure-sensitive labeling applications. The global board of directors for Dscoop (Digital Solutions Cooperative) will convene in Washington, D.C. this month to strategize education and content delivery for members around the world. The independent community of HP graphic arts customers encompasses members across North America; Asia-Pacific; Europe, the Middle East and Africa (EMEA); and Latin America. As a global organization, Dscoop is launching a new face-to-face networking event called Dscoop at drupa. It will bring together members from North America, Latin America, Asia-Pacific and EMEA to experience the major industry trade show, ‘lending a closer-knit community feel to what can otherwise be a solitary experience’. At Dscoop at drupa, Dscoop Asia-Pacific will host a two-day conference prior to the start of drupa. Around 800 Asia-Pacific members are expected to attend. For Dscoop EMEA, which has only existed for five months, the support of the global board and the existing organization in other regions is essential to spreading the word and increasing members. The global board of directors brings together leaders from each region to oversee the actions and events that affect more than 6,000 Dscoop members worldwide. Their responsibilities include financial oversight of operations, education and content delivery, as well as control of the Dscoop brand and standards. In addition, the board works closely with each regional board to ensure sustained growth and independence. Eric Hawkinson serves as the executive director overseeing the global leadership team. The rest of the board is comprised of: chairman, Chris Petro, global soft digital solutions (US), Alon Bar-Shany and Jan Riecher, HP, Craig Curran, Nosco (US), Erwin Koerts, Drukkerij Aeroprint (The Netherlands), David Minnett, Group Momentum (Australia), Yukinori Okamoto, FIS (Japan), Gary Peeling, Precision Printing (UK) and Larry Vaughn, Seebridge Media (US). Zebra Technologies Corporation, a recognized global leader in enabling technologies that extend visibility into operations, today announced the release of the GC420, GT800 and EZ320 desktop and mobile printers which are designed exclusively for the unique requirements of the Asian markets. Offering geo-centric features based on inputs from customers in Asia, the printers provide businesses with greater visibility and control to compete in the global marketplace. Built for productive and efficient workplaces, the GC420 and GT800 minimises downtime through faster print speeds and fewer media changes with their longer ribbon capacity. With features typically found in higher end products, the printers offer robust features and price points while reducing customers’ operating costs. These include greater memory space of up to eight times of existing printers in the marketplace. The GC420 and GT800 also incorporate co-resident EPL and ZPL programing languages, making it easy to integrate with customers’ existing Zebra print infrastructure. With India’s booming mobile workforce expected to grow to 205 million by 2015, Zebra also launched the EZ320 mobile receipt and ticket printer. Designed to enhance field force automation and sales force automation with Bluetooth wireless connectivity and deliver reliable performance on the road, this printer is a cost effective solution to cross vertical business needs. Small, lightweight and durable, the feature-rich mobile printer offers an affordable and ideal solution for mobile applications such as e-citation, proof of delivery and field insurance inspection receipts. 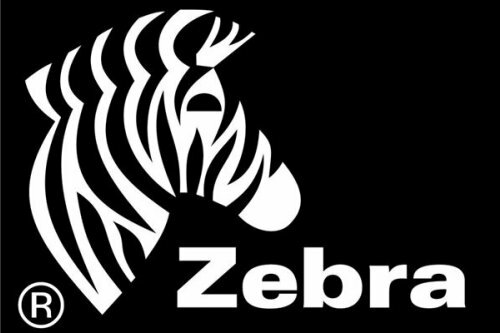 A global leader respected for innovation and reliability, Zebra Technologies Corporationprovides enabling technologies that allow customers to take smarter actions. Our extensive portfolio of bar code, receipt, card, kiosk and RFID printers and supplies, as well as real-time location solutions give a digital voice to assets, people and transactions that provides greater visibility into mission-critical information. 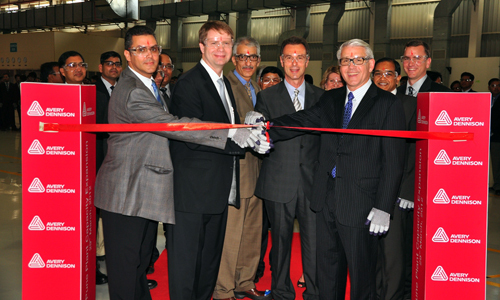 UPM Raflatac has opened a new slitting and distribution terminal in Buenos Aires, Argentina. 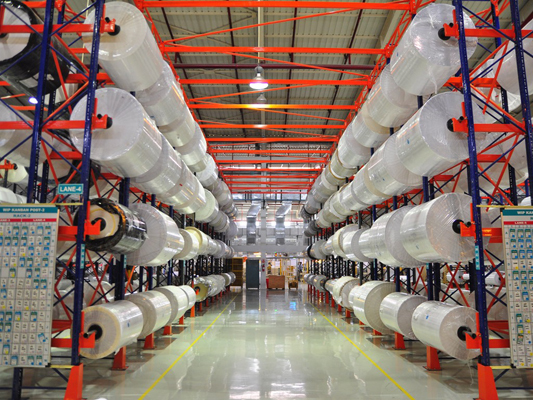 The terminal began operations in early March and will supply both paper and film labelstocks to customers in Argentina. The new terminal demonstrates UPM Raflatac’s commitment to improving its service capabilities and product offering to meet growing demand in the South American region. “The opening of our new terminal in Argentina is an important strategic step for UPM Raflatac. We are excited to offer our high-quality labelstocks and to be able to significantly improve our service capabilities to the market in Argentina,” says Jouko Lähepelto, Senior Vice President, Americas & Asia Pacific. The Argentina terminal complements UPM Raflatac’s service network in South America, comprised of a labelstock factory in Rio de Janeiro and a slitting and distribution terminal in Jaguariúna, Brazil. UPM Raflatac, part of UPM’s Engineered Materials business group, is one of the world’s leading suppliers of self-adhesive label materials. UPM Raflatac has a global service network consisting of 12 factories on six continents and a broad network of sales offices and slitting and distribution terminals worldwide. UPM Raflatac employs 2,400 people and made sales of over EUR 1.1 billion (USD 1.6 billion) in 2011. Stora Enso is appointing three new members to its Group Executive Team. At the same time three current members will leave the team to take new positions inside and outside the Company. Karl-Henrik Sundström has been appointed Chief Financial Officer with effect from 1 August 2012. He joins Stora Enso from the Dutch semiconductor company NXP, the former Philips semiconductors business located in Eindhoven. Karl-Henrik Sundström has spent most of his career with the Swedish telecommunications company Ericsson, building his career from Latin America and managing the company’s business in Australia to finally first becoming head of Global Services and later Executive Vice President and CFO of Ericsson AB. “In his last two roles, as CFO of one of Sweden’s largest companies for almost five years, and currently as CFO of NXP, Karl-Henrik Sundström has proved to be a world-class CFO. His additional experience of running a business will greatly contribute to our efforts to renew Stora Enso. We all warmly welcome Karl-Henrik to our team with high expectations,” says Stora Enso CEO Jouko Karvinen. Head of Stora Enso Global Identity Lauri Peltola, and General Counsel Per Lyrvall are also appointed as new members of the Group Executive Team as of today. “With Lauri Peltola joining the Group Executive Team, we underline the importance of our Global Stora Enso Identity, Global Responsibility and Rethink in the Executive Team work. With Per Lyrvall's appointment, we further emphasise the importance of our values, our transparency and our Code of Conduct, as well as one of our key Leadership Themes, ‘Do what’s right’,” emphasises Jouko Karvinen. The following three members are leaving the Group Executive Team: Hannu Alalauri, formerly head of the Fine Paper Business Area, has been appointed as the head of the Packaging Solutions Business Unit and joins the Renewable Packaging Management Team. Bernd Rettig, currently responsible for energy, logistics, R&D and capital investments, will continue with R&D and capital investments, but will also increase his focus on managing Stora Enso’s large capital investment projects. He continues to report to the CEO. The current CFO, Markus Rauramo, has been appointed as CFO of Fortum Corporation. He will remain with Stora Enso and in the Group Executive Team until Karl-Henrik Sundström joins the company. The goal of Harper Corporation of America is to create quality products and services that improve client processes. As a member of Harper Corporation's long line of quality products, Harper Bridge Sleeves reduce waste, increase cost-effectiveness, and enhance the efficiency of client processes. Harper Bridge Sleeves will be on display at the FTA's 2012 Annual Forum & Info*FLEX Exhibition March 18 – 21 in San Antonio, Texas. Barend Smit, Director of Label and Litho opted for their second Rotocontrol finishing machine also from a longstanding relationship with Rototec who supplies their Tooling product. Dependable service and superior quality were factors that led to their additional Rotocontrol finishing machine investment. Label & Litho is the main supplier of barcode and RFID labels in Northern Gauteng. The company is also the largest supplier of magnetic and other types of parking tickets nationally and aims to deliver customised printing to meet unique customer requests. Rotocontrol designs and manufactures leading edge inspection, slitting, rewinding and die cutting finishing machines for the narrow web industry. Available globally, Rotocontrol offers machines from smaller basic rewinders to feature rich, sophisticated models with multiple options. All utilize S-Drive Servo Technology enabling maximum web control for the most delicate film and foil materials. With the recent acquisition of LeoMat, advanced products including booklet insertion and digital finishing are immediately available. Headquartered in Ahrensburg (Hamburg), Germany Rotocontrol maintains the highest level of product quality through ease of use, absolute control and flexibility. Rotocontrol is the partner of choice in the finishing of label products. 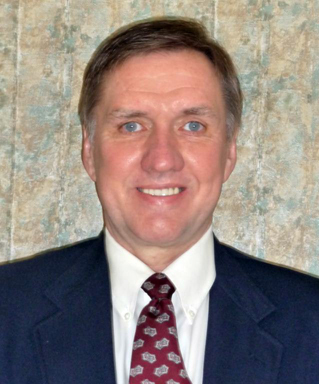 Label Traxx - the print business management software for flexographic and digital narrow web label printers and converters - has named Keith Grimm as Business Consulting and Audit Specialist. In his new role, he will be available to Label Traxx customers who need assistance with a wide variety of business and software implementation issues. An Economics and Public Administration graduate of Southwest Missouri State University, Grimm brings Label Traxx nearly 30 years of extensive experience in label production management, database implementation, and information systems technology. Label Traxx provides automated job management software for the printing industry. The company was formed as Tailored Solutions in 1993 by Ken Meinhardt and David Porter, both of whom remain active in the business. Worldwide, Label Traxx is the most popular print business management software for flexographic and digital narrow web converters and printers. RBP Chemical Technology has introduced a new heavy metal precipitant formulated to remove metals from wastewater streams. New RBP MetalTreat 529 is particularly useful in treating wastewater from plating operations, and provides nearly complete precipitation of metals, producing a compact, highly insoluble, sludge cake even in the presence of other chelating or sequestering agents. Founded in 1954, RBP Chemical Technology is a global supplier of proprietary chemicals and delivery devices for the printing, newspaper, and electronics manufacturing industries. RBP Chemical Technology products are manufactured in a 48,000 square foot plant in Milwaukee, Wisconsin; in a wholly owned blending facility near Mumbai, India; and by approved blenders in the US, South Korea and Thailand. RBP Chemical Technology is ISO 9001:2008 certified. RBP products are sold and serviced by factory-trained sales and service representatives and distributors in the Americas and Asia. The Cover Project of Tobacco Journal #5, October/November 2011 was awarded with the Golden Print Quality Award 2012. It is a sample sheet for where design can go with the latest tools in print using different technologies for one product. Siegwerk was the partner for inks and lacquers. During the Operational Conference of the Packaging & Label Gravure Association (PLGA Global) in Miami, USA, at the beginning of March Dutch Van Heertum Design (VHD) received the award. They created the design and provided the platform for the partners of this unique cooperation. “This project was only possible through a very close cooperation between 14 authoritative technical companies, which are part of our international innovations network,” said Frans van Heertum, VHD’s Creative Director. Siegwerk was the partner of choice for its ink and lacquer expertise. Thomas John-Zähringer, Account Manager & Technical Support Tobacco at Siegwerk: “This project was a great team achievement of our whole Tobacco Business Unit. It is living proof of what print is capable of: highly innovative solutions to turn standard products into pieces of art.” More than 40 print runs on both gravure and offset machines created the visual and tactile effects of the folded cover, using bronzing and hot foil technology. Before the finishing, debossing and embossing were done and in the end the publisher bound the covers with the rest of the magazine. Ink, Heart & Soul – our company philosophy incorporates what our customers experience every day. We produce inks and individual solutions in close cooperation with our business partners. 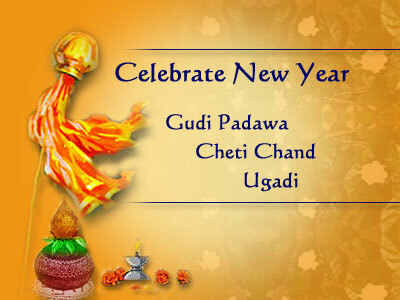 We are steeped in tradition, yet practice-oriented and with state-of-the-art technology. With more than 180 years of experience, Siegwerk commands a profound product knowledge and expertise for many printing methods. Our actions are market-driven – or even drive the market, which is proven by our many patents. With currently 4,400 staff in more than 30 country organizations we are able to supply and support every customer anywhere in the world. The Printed Electronics and Print Automation theme parks will be special highlights at the drupa innovation park 2012 presented by digi:media (dip) in hall 7.0. Printed electronics technology is all set to revolutionize production in many industries in the foreseeable future. Numerous printed electronics companies will present their latest exciting innovations at the dip, together with the OE-A (Organic and Printed Electronics Association). drupa 2012, print media trade fair, will take place from May 3 - 16, 2012 at the fairgrounds in Düsseldorf, Germany. An interactive business card incorporating a flexible display, “talking” packaging or a board game with a printed battery and flashing OLEDs – printed electronics open up a broad spectrum of possibilities and fields of application. So many, in fact, that the Organic and Printed Electronics Association (OE-A), a working group within the VDMA (German Engineering Federation) was founded a few years ago as an interface for communication and development for the various fields of research worldwide. It represents the entire value-added chain of organic electronics, including materials manufacturers, plant engineers, producers and users – and now has more than 120 members worldwide. The goal of the OE-A is to provide orientation in the large variety of technical developments and help define possible fields of application. The logistics industry in particular benefits greatly from the use of RFID chips, which store and pass on information via contactless reading devices to a central system, thereby helping to monitor the commodity chain and prevent product piracy. The enormous potential offered by printed electronics will become especially evident when their use becomes economically viable and practical, not just on the outer packaging but also on the individual products themselves – due to their ability to reduce costs and simplify integration. In the field of medicine, billions of these printed sensors are already being used. Electronic books with organic electronic controls that will make flexible displays possible in the future are another fast-growing field of application. In the medium and long term, strong demand is also predicted for intelligent packaging that combines features such as sensors, battery, display, logic and RFID technology. The printing industry will be able to apply all of the above-mentioned functions in the future. Particularly due to their additional usefulness these features are becoming increasingly attractive for customers and readers alike. Using nanotechnology, even wafer-thin displays, for example, can be printed on tickets, greeting cards and packaging as well as in magazines and catalogues. Publishers are already experimenting with integrated displays and other additional functions for their print products. 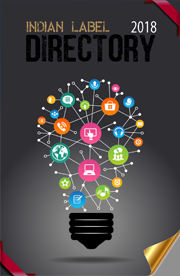 “This is a quantum leap for customers wishing to advertise and has a realistically high level of potential for the printing industry. For this reason it was important for us to integrate this topic in the drupa innovation park. These technologies enable new fields of business to be developed on an entirely new market,” explained Manuel Mataré, Director of drupa 2012. The IT company ipactor GmbH (www.ipactor.de) will exhibit at the Print Automation Park for the first time. “In order to understand us, people have to get to know us. We are a handful of IT experts with the aim of comprehensively assisting every person with any question about information technology. We don’t care which operating system someone has or in which industry they are “at home”. Our goal is our motto: improving structures! We look forward to presenting this to the visitors with our print plan within the drupa innovation park,” remarked Matthias Welland from ipactor GmbH. As an additional step to develop the Chinese Flexo industry and to further develop the Chinese flexo market and improve the talent and education within this industry, Flint Group Flexographic Products and the esteemed Shanghai Publishing and Printing College signed a general cooperation agreement recently. The purpose of this cooperation is to promote education, consulting, research, development, technology service and career guidance in the Chinese printing and packaging industry. Pallets from Jeco Plastic Products - designer and manufacturer of plastic pallets and containers for the worldwide printing and automotive industries since 1973 - will show its latest products on stand 02/B54, at drupa 2012, the quadrennial printing industry exposition held in Dusseldorf, Germany. 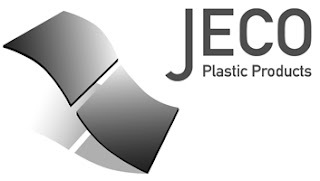 Jeco products also may be seen at the show on the stands of partners Heidelberg, Sakurai, Muller-Martini, and Horizon, as well as at the Heidelberg factory in Wiesloch, Germany, where large format offset demonstrations will be held. The show, held this year May 3-16, attracts printers of every sort, as well as their suppliers and customers, to see the latest technologies available. Jeco Plastic Products designs and manufactures extremely durable pallets and containers for the worldwide printing and automotive industries, as well as other industries handling heavy product which must be protected from damage. Other capabilities include the ability to produce complex plastic structural components made to exacting tolerances. 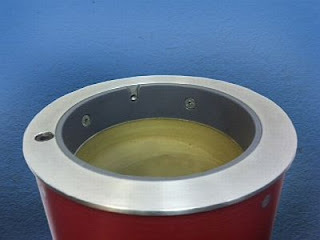 Jeco production facilities include rotational plastic molding and thermoforming capabilities unique in North America. Jeco designers employ complex plastic compounds to impart dimensional stability and structural integrity to their products. 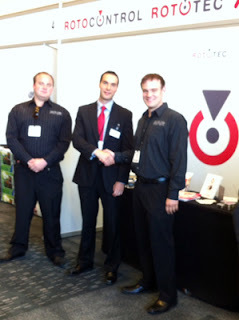 Roland DG was represented at the show by packaging sector specialist, Revolution Transfers, a Roland authorised dealer. The applications and processes demonstrated by the two companies left visitors in little doubt – Roland’s UV print and cut technology heralds a new era in producing packaging prototypes quickly and cheaply.